On December 18, 2014, Linda and I visited Hidalgo’s Festival of Lights. The night was rainy, which made riding in the Santa Express a little uncomfortable, but we still had fun. I used the helmet camera again and I think the video is better this time. The Festival of Lights is very similar to a previous trip to Santa’s Ranch. The City of Hidalgo, along with a community of volunteers and local sponsors, has been hosting the Festival of Lights for 24 years as of 2014. There are multiple ways to tour the lights. You can drive your own vehicle by following the directional signs or ride a trolley at city hall. The Festival of Lights starts at 704 E. Texano Dr., Hidalgo, TX. 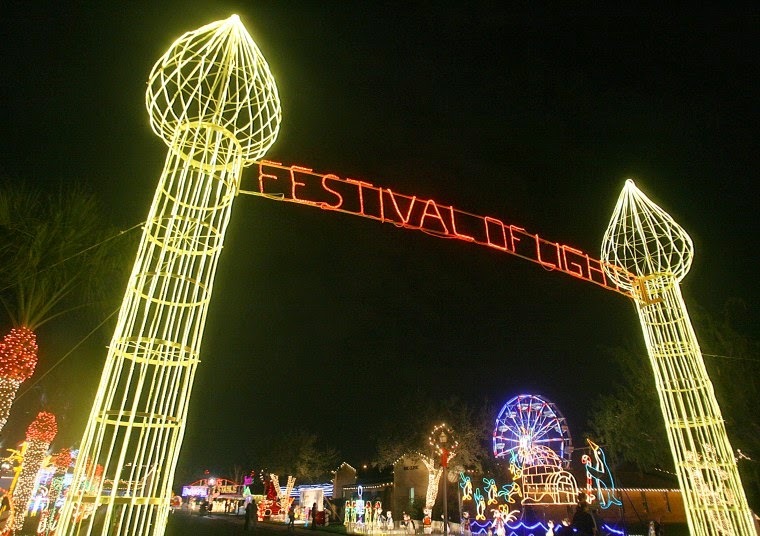 Furthermore, the Festival of Lights is the largest light festival in Texas with over 3 million lights this year divided up among 8 locations. The event runs from December 1st to the 31st starting 6:00 PM. The price to tour the lights in your own car is free! However, if you want to ride the trolley and receive a dinner with musical entertainment that deal is available for $12. To get tickets, call (956) 843-5311. Finally, there are carnival rides, photos with Santa, and Mexican artisans at city hall for even more fun. The Carnival available during the festival. A little empty at the time because of the rain. The dinner starts at 5:30 PM, but we found a parking space (don’t worry someone will direct you into a parking lot) around 5:00 because we didn't want to be late. We walked over to the city hall porch where there were multiple tables lined up for eating. Our dinner was a choice of coffee, tea, or water, brisket, green beans, corn, mash potatoes, a roll, and a piece of cake. After dinner, we walked over to the trolley pick up location, but because it was raining, they were running three trams instead of the trolley aka Santa's Express. We missed those first three trams, so the staff moved us over to a covered area for a 30 minute wait. However, they decided to fire up the Santa Express shortly after that, and we hopped right on. The start of the tour took us past Eskimo and multiple penguins. Cars are backed up in this area because it is the start of the tour and the entrance to the parking lot. We then moved on to an area with Mexican themed designs, like a Mayan Pyramid. After a bit, we made it to Santa’s Train Station in Old Hidalgo. The theme comes from the actual Hidalgo train station (it’s no longer in use though). At the corner, there is a fire truck and a fire dog, followed by Santa’s Candy Workshop. One of the final locations on our tour is the Christmas Around the World section. There are multiple world recognized buildings like the Eiffel Tower and the Leaning Tower of Pisa. After this it was a short ride back to city hall where we exited Santa’s Express. The weather resulted in the live music being moved under a small tent, which was overcrowded. So, we decided to head home for the night. In other news, Team Adventures With BeeGee will be taking the Christmas holiday and New Year’s off, so unfortunately there will be no new post until after that time. However, there will be more post after that time and we look forward to you checking them out. Until then, happy holidays and have a good New Year’s. What has been your favorite Christmas light even this year? If you like the blog, go ahead and follow us on Facebook.